This page is now archived. We only recommend Marcel Van Den Berg in Koh Tao as the best place to do your PADI IDC in Thailand. PADI Course Director, Sarah Kench started diving in the mid nineties in Beautiful English waters. After organizing several trips from England to the Red Sea and fun diving in the Caribbean Islands, Dominican Republic, Malaysia, Mexico, Indonesia and the Philippines, she decided to take a chance, leave her job and turn her hobby into a career. Previously I was a Senior Manager with HSBC then after several trips to the Similan Island’s with Scuba Cat, she completed her PADI IDC in 2004 got rid of my life and became a full time PADI Instructor in Phuket. I worked as a videographer, also teaching all the PADI Courses and Customer Services in the Scuba cat Shop. 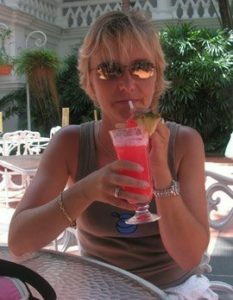 In 2007, she became the owner of Scuba Cat, which at the time was a 5 * IDC however after only a couple of months it was awarded the prestigious 5 * CDC Centre. Sarah organize’s a PADI IDC every month. She spends her time making sure everyone receives relaxed uncrowded and enjoyable diving whether it be their first or 1000st dive! You never know where you ill find her next: in the office answering emails, teaching the award winning PADI IDCs or with the Scuba Kittens…….the next generation of divers! As well as being the only active Female PADI Course Director in Phuket I am the only DDI Instructor Trainer in Asia. Scuba Cat Diving philosophy is to have all customers satisfied with quality of instruction and want to see all of them living with a big smile on their face. As a fact Scuba Cat Diving has lots of return costumers over the past decades. 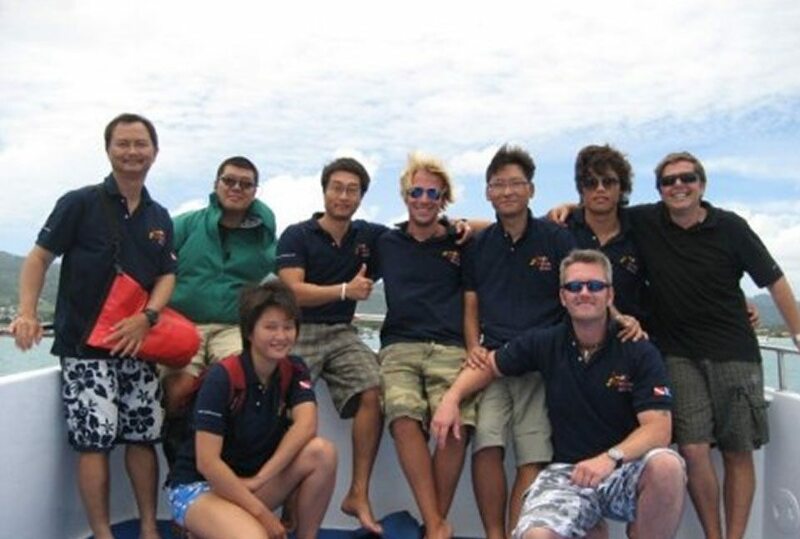 Scuba Cat Diving has developed over the past decades different sections with liveaboards, fundives, Instructor levels, career packages, Internships and Tec Diving. Each section has highly professional staff to give the best quality and customer service. Scuba Cat Diving is very much involved in environmental projects such as Reef check, Project AWARE, Green Fins, Reef balls and National geographic. We encourage our students to join us in our different projects. Our philosophy is to preserve the environment for future generation. Scuba Cat Diving is a very well established 5 Star CDC centre, with 1 liveaboard and 2 daytrip boats. For the professional levels we use a 20/20 metre swimming pool designed for diving, we have as well 5 different classrooms, one dedicated for IDC with wireless which make easy for candidates if they want to look up at information on the PADI website during the presentations. All our open water training dives are conducted from our boats. Accommodation for our candidates is a couple of metres from the classrooms and less than one minute from the beach. Once during open water presentation, the first candidate had controlled descent dive 1, I had to stop the exercise because of a whale shark passing by. What is the reason Divemasters should take their IDC with you? 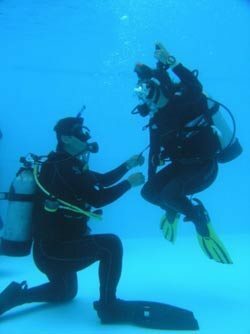 Scuba Cat’s IDC Team and myself have developed a program to assist candidates before, during and after the IDC. course with personal studies, if they have time before the IDC they are more than welcome to come to join us to assist a course, do to a skill circuits or assist any Divemaster lecture to refresh their knowledge and enjoy a couple a couple of fundives. During the course we provide an environment to make all the candidates feel at ease, we extended our IDC to give more opportunities to our candidates to practice, we organize lot’s of different workshops in confined water, open water and the classroom to prepare our candidate not only for the IE but for their future career as an instructor. During the IDC, there is a start time in the morning but no finishing time at the end of the day, if a candidate needs extra time we are always there to help them. After the IDC / IE, we organize a workshop to set a resume and to advise them how to interact within the dive industry. Many of the candidates come back to carry on with their education to become Staff instructor, Master Instructor and PADI Course Director. We keep in touch with all our candidates and give them incisive information about the development of their career. Scuba Cat Diving team has a very long experience in instructor development and diving career, these decades of experience are reflected in our programs. Does not matter where I am going diving, a swimming pool, pond, lake, river, I just love to be underwater. If you didnt know the diving in Phuket is amazing. Sarah loves to spend time enjoying the outdoors, living in Phuket there are so many places to get away from the hustle and bustle to enjoy the beaches and the National Parks around. It’s a privilege to be able to share the same passion with people from different background and bring them to an instructor level, and finally work with them. One IDC is never the same as the next, each group is different with the personality of the candidates. What do Sarah’s students think of her? Thanks to a lot of people and Scuba Cat for sure…Sarah giving us a perfect place to learn and practice, all the instructors coaching us and certify us as beginners. Sarah, I want express my gratitude and thanks for such a wonderful time you gave us out there during our IDC. Believe me I enjoyed thoroughly the course with all you guys around. You were so positive all the time and gave us so much of encouragement. All the arrangements were superb with a fantastic PADI Course Director. You have a great team out there and I sincerely hope and pray that you and your dive center does extremely well in future. Hi dear Sarah, We all passed and you made us to do it.It was from your help.I will remember it always.Thank you for everything.Hope see you soon. To carry on my amazing lifestyle! 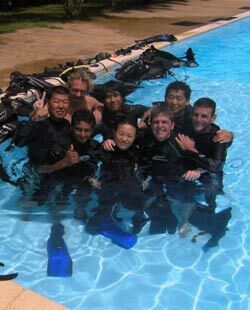 To keep on teaching Instructor courses with Scuba Cat Diving which provides me one of the best setting and professional teaching environment in the world. IDC Guide Recommends you take your PADI IDC in Thailand with Koh Tao with Marcel Van Den Berg.